Apple is hosting a big iPad Air 2 and iPad mini 3 reveal today, but the company started by dropping a little tidbit on its first wearable device. 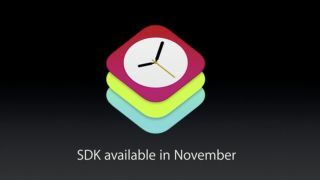 CEO Tim Cook announced the Apple Watch SDK will arrive in November, giving developers the tools they need to create software for the smartwatch. The Apple Watch release is still slated for early 2015, and Cook expressed his excitement for the wearable hitting the market. Cook was sporting a white Apple Watch on his wrist during the iPad Air 2 and iPad mini 3 presentation, and we got our own hands on time with the wearable during the iPhone 6 and iPhone 6 Plus launch last month. Apple Watch may be ambitious enough to rank as the best smartwatch among the young smartwatch pile. Whether it's enough to get the category off the ground remains to be seen. All the news from Apple's event, right here!